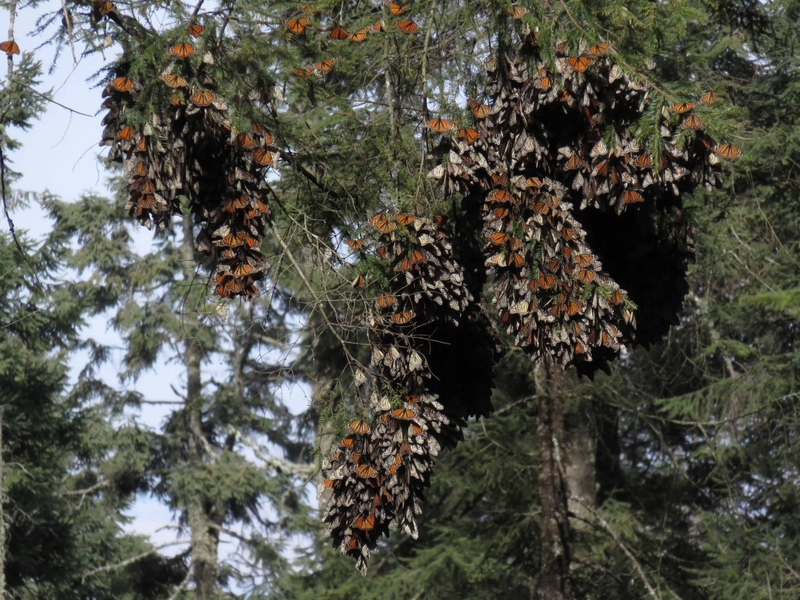 In recent months there has been disturbing news about the decline of the Western Monarch population. The North American Monarch Butterfly (Danaus plexippus) is a familiar and charismatic insect. It is known for its amazing migration and its reliance on one plant in particular: milkweed. The monarch spends the winter along the California and Mexico coastline. When early spring arrives these butterflies begin a long distance, multi-generational migration. They travel as far as Arizona, Nevada, Idaho, Utah, Oregon, and Washington. There are many hazards along the way. The monarchs that start their migration in the spring will not live long, so in order to lay their eggs they must locate a stand of milkweed. Once laid, it takes three to five days for the eggs to hatch into caterpillars. Monarch caterpillars feed exclusively on milkweed. They grow and molt through five developmental stages over a span of 14 to 18 days. Each caterpillar then spins silk attaching itself to a milkweed leaf or stem and forms a chrysalis (hardened outer protector). After about 10 days it emerges from the chrysalis as an adult butterfly. The lifespan of this adult butterfly is very short – just two to six weeks. In that time it feeds on nectar and continues the migration journey. It might take three or four generations to reach the end of the migration. The last generation (which has a lifespan of months rather than weeks) flies back to its ancestral start where it overwinters in large trees. In Pacific Grove, California they overwinter in a large grove of eucalyptus trees. 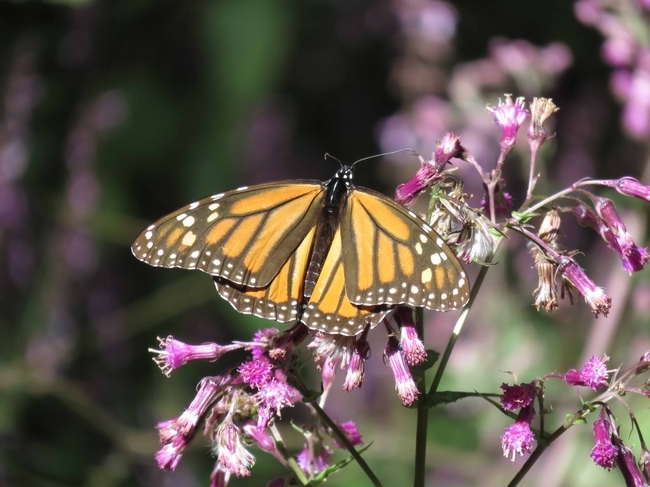 As of February 2, 2018, according to the Xerces Society for Invertebrate Conservation, monarch populations in western North America were at their lowest point ever. There used to be millions of monarchs that overwintered along the Pacific Coast of California and Mexico. There were an estimated 4.5 million in the 1980s. In 2018 the annual Xerces Western Monarch Thanksgiving Count totaled only 28,429. The population is now 6% of what is was in the 1980s. The reasons for Monarch decline are varied, and include habitat loss, disease and predation, use of herbicides and pesticides, and climate change. What can be done to help these beautiful pollinators? Butte County by planting native milkweed and nectar-producing flowers that bloom from spring to fall. This can be as simple as planting annuals like zinnias, sunflowers, and asters in your garden. Even if your garden is small you can dedicate a small area or container to pollinator-friendly flowers. Milkweed is a perennial plant. It is named for its milky, latex sap. Milkweed is drought tolerant and deer resistant. The native species are not invasive. 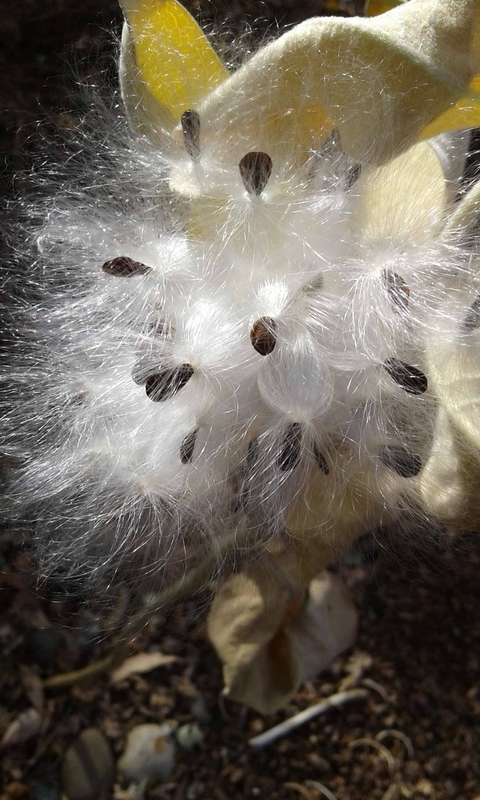 Milkweed plants develop large fleshy seed pods. When the seeds are mature, the pods pop open, freeing the seeds. Attached to the seeds are fine tufts of hairs (called pappus) which aid dispersal of the seeds: as the wind blows, it catches the silky hairs, carrying the seeds away from the plant. The seeds can be collected from the pods for later propagation or left alone to re-seed themselves. Milkweed belongs to the genus Asclepias. 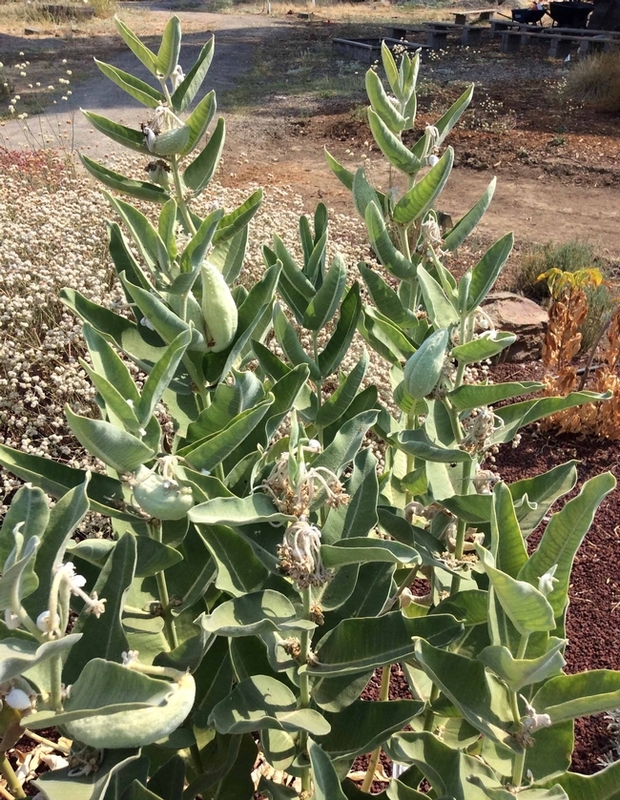 The California native milkweed species that are most commonly available commercially and grow well in this area are narrow-leaved milkweed (A. fascicularis) and showy milkweed (A. speciosa). 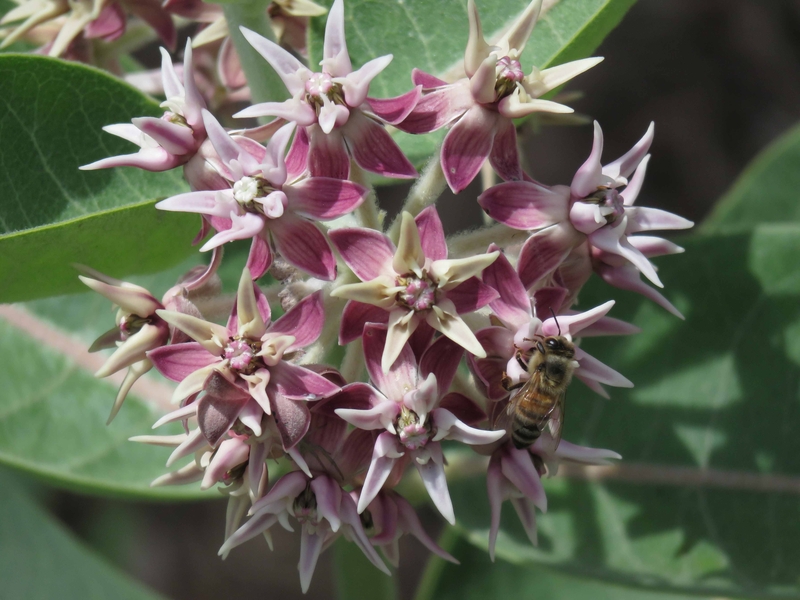 Other native milkweed species that are not commonly available include California milkweed (A. californica), wooly milkweed (A. vestita), woolypod milkweed (A. eriocarpa) and heartleaf milkweed (A. cordifolia), which is suited to the Sierra foothills. 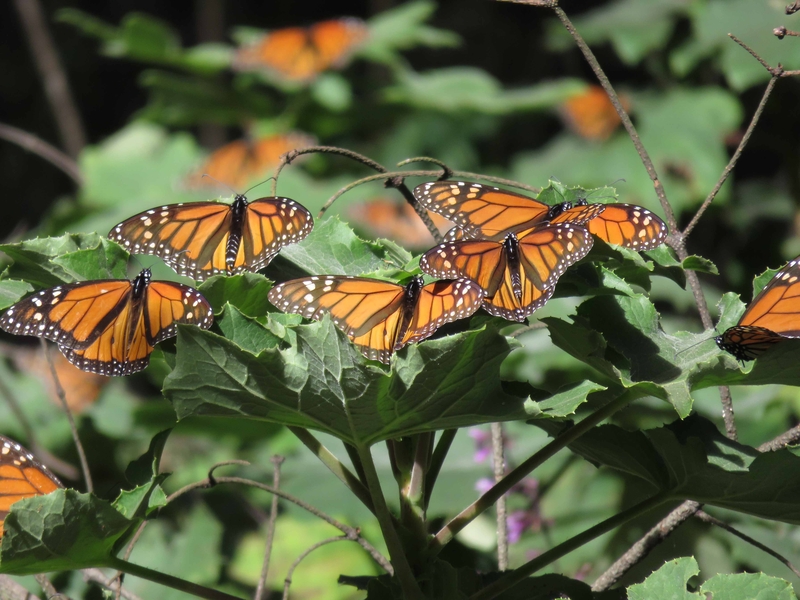 Home gardeners can aid the Monarch population by adding milkweed to their landscape, pollinator garden, herb garden, or even a patio container. If you own a larger plot of land you might consider letting some of it remain wild, so that the wild nectar producing flowers are available not only for butterflies, but for other pollinators as well. Hedgerows that include milkweed and nectar flowers are a wonderful way of attracting wildlife and pollinators. 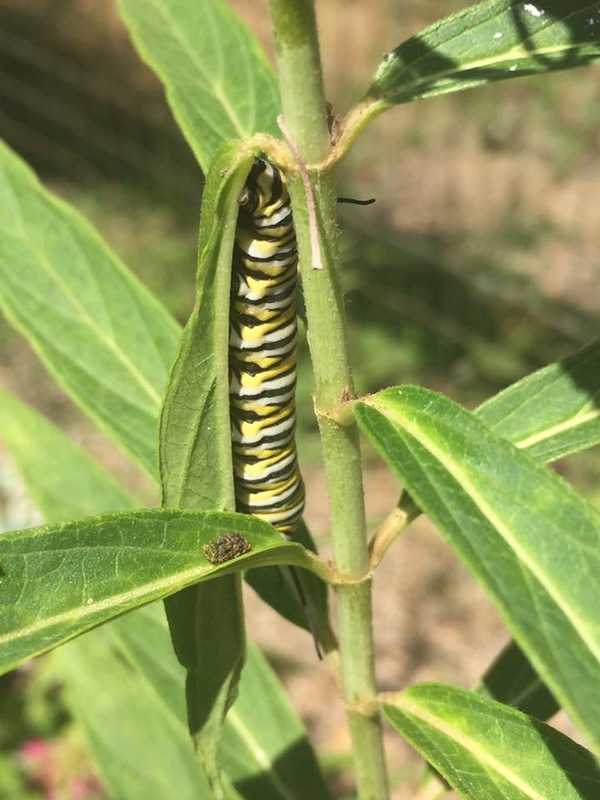 Creating a monarch way station (a garden that includes milkweed, nectar flowers and a water source) is a nice addition to a community or school garden. Once the monarch lays its eggs and the caterpillars hatch, they will devour most of the leaves on the milkweed plant. By the time the caterpillars are ready to morph into chrysalis, the plant will look dead, but don't despair -- the leaves will grow back. Milkweed is also a great host plant for many other beneficial insects including bees, beetles, and lady beetles (ladybugs). It will also attract a yellow aphid known as Oleander aphid. This aphid will not destroy the plant and it will not infest nearby roses or vegetable gardens. It is plant specific: think of the Oleander aphid as food for the lady beetles. Avoid using pesticides or herbicides that might damage these breeding and feeding areas. Use caution where you plant the seeds, as milkweed can be toxic to livestock. 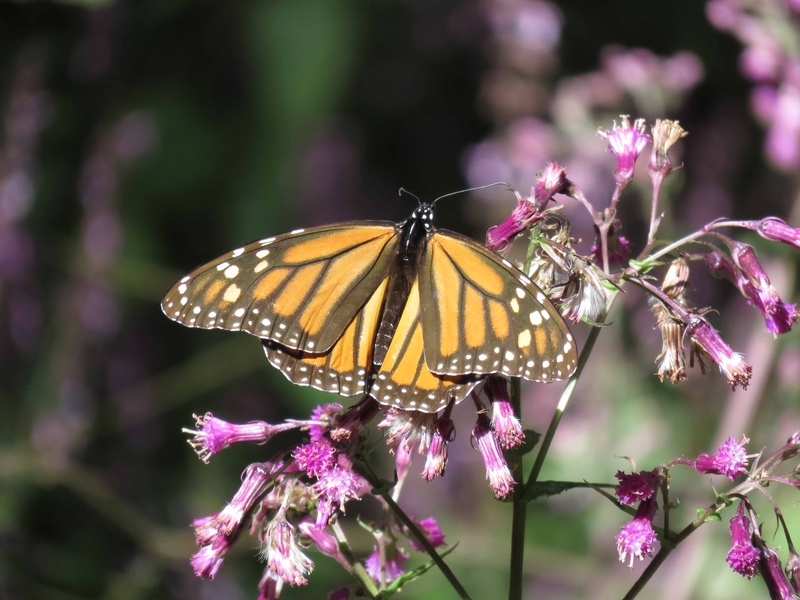 For more information on Monarchs and milkweed, visit the Xerces Society for Invertebrate Conservation. Their website also includes area-specific nectar plant lists. For information on area-specific native plants, including milkweed, the Theodore Payne Foundation is an excellent source. Finally, local butterfly experts highly recommend Monarchs and Milkweed: A Migrating Butterfly, a Poisonous Plant, and Their Remarkable Story of Coevolution by Anurag Agrawal (2017).An interview with Agrawal on this subject recently aired locally on the North State Public Radio program Cultivating Place, and is available as a podcast here. 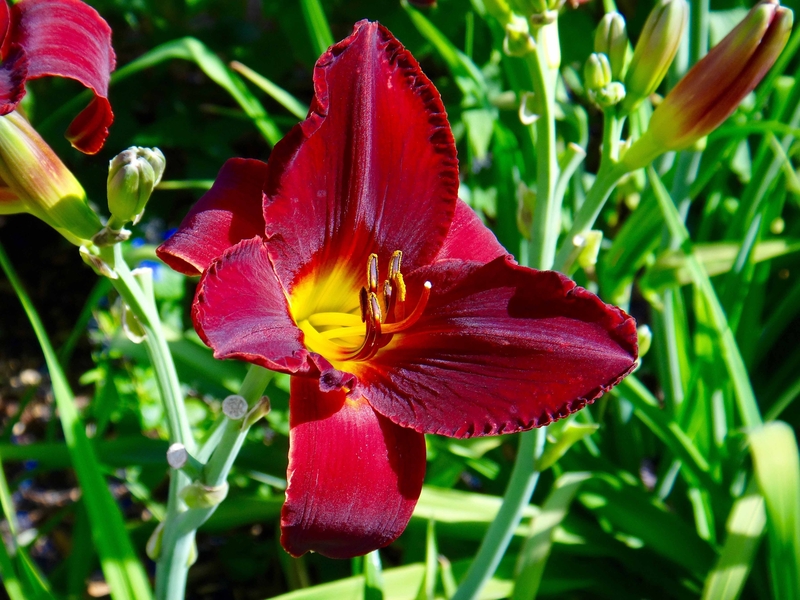 For more information on gardening in our area, visit our website Butte County Master Gardener. If you have a gardening question or problem, call our Hotline at (530) 538-7201 or email us at mgbutte@ucanr.edu. 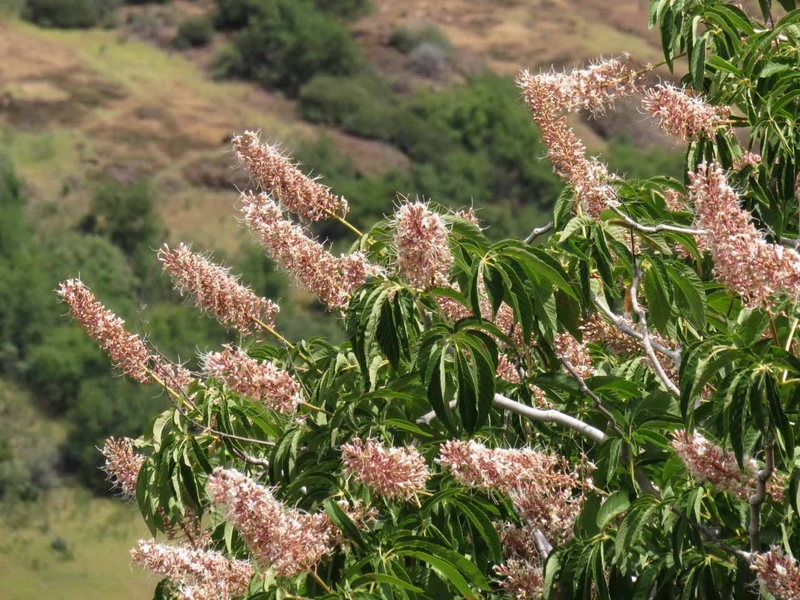 Our California buckeye has doubled down on the ecological playing field: it's the high roller of the hardy foothill species explored in this series. Sonoma County Master Gardener Sue Ridgeway describes the California buckeye as “a species superbly adapted for survival,” because not only does it have a growth habit designed to circumvent drought conditions, but also “a highly effective reproductive strategy,” with leaves and shoots protected from grazing animals by noxious, toxic compounds; prolific flowers attracting multiple native pollinators; and viable seeds too poisonous to be consumed. On a biological scale, the gamble has paid off: buckeyes have an estimated lifespan of 250 to 300 years. 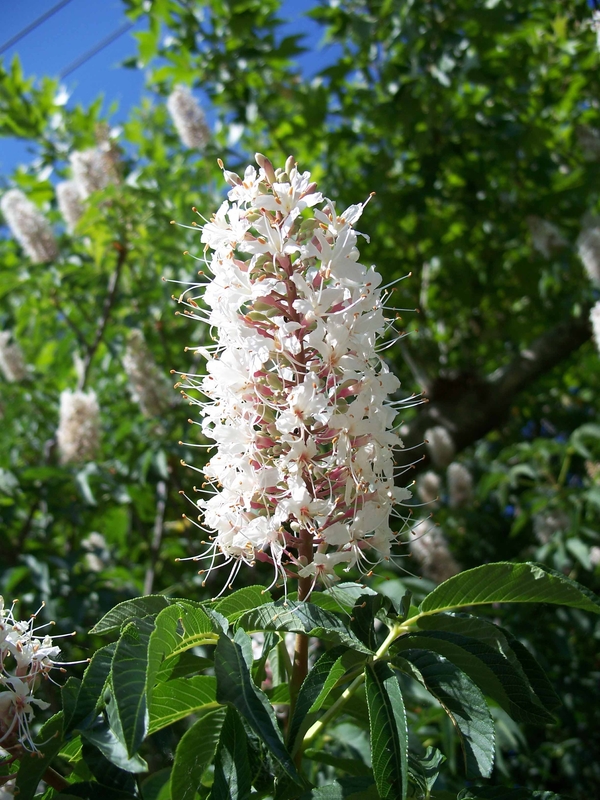 Aesculus californica is a woody shrub or small tree that has adapted to a variety of microclimates in our state: it can be found along the central coast and in the foothill and lower montane elevations of the Sierra Nevada and Cascade Ranges. It grows as far north as the foothills of the Siskiyou Mountains, and as far south as northern Los Angeles County. Native buckeyes can grow in elevations as high as 4,000 feet (one source claims 5,500 feet), but most commonly these plants colonize the foothill altitudes. A true California native, it is found nowhere else in the world. Buckeyes are a beautiful and striking presence on the landscape. In fact, this native is so lovely that it is used as an ornamental plant for its attractive lime green palmately compound leaves[JHC1] (shaped like the palm of the hand) composed of between 5 and 7 individual leaflets, fragrant white flowers, and handsome, thick-stemmed, smooth silver bark. Its stands out visually from its fellow foothill species precisely because of its evolutionary adaptations: it is the first to leaf out in the spring; the last to bloom; and the first to lose all its leaves. 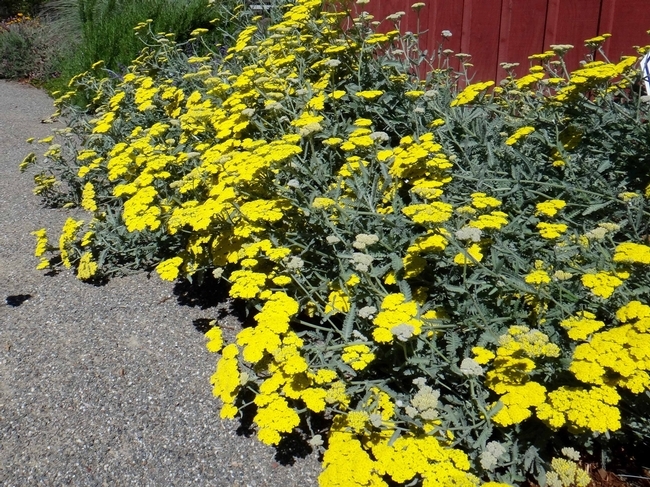 In particularly hot, dry years, the leaves can drop prior to the blooms, making the large, showy flowers (up to 12 inches long) even more conspicuous. When leafless, the skeletal structure of mature buckeyes appears to be sculpted and arranged by the hand of an artist. The California buckeye's variable height attests to its nuanced response to climatic conditions: in northern reaches, the buckeye is shrubby and squat (about 12 feet tall). Further south, it can reach tree-like statures of up to 30 feet. In the kinder habitat conditions of the Coast Range, an Aesculus californica has attained sufficient proportions to be registered as a California Big Tree. That one, in Swanton Pacific Ranch, measures 46 feet high, has a trunk circumference of 176 inches, and a crown that spreads to 60 feet. The seeds of Aesculus californica are contained in a thick leathery husk, which splits when dried, and are the largest of any non-tropical plant species. These seeds (also called nuts) are the origin of both of its common names: buckeye and horse chestnut. 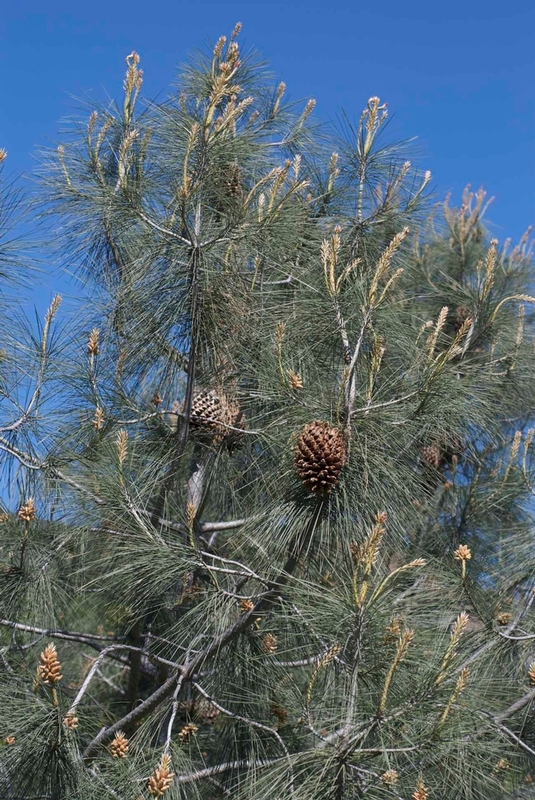 According to Cal Poly's Select Tree web page, Native Americans called the seed "hetuck" (buck eye) because its markings resemble the eye of a deer. The seeds also resemble those of the European sweet chestnut (Castanea sativa). And there the resemblance ends, as the heavy seeds of the California buckeye are toxic, thus limiting its reproductive dispersal strategies to rolling downhill or being conveyed by water. 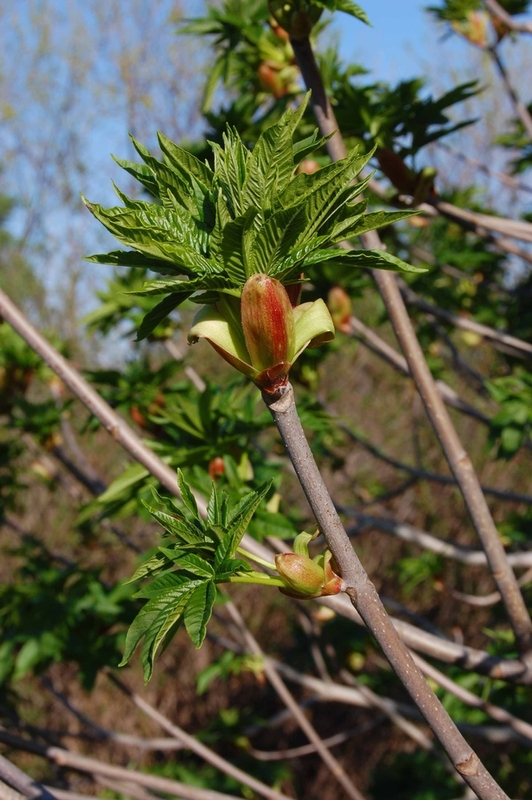 In addition to toxic seeds, the buckeye's leaves, shoots, and flowers are poisonous. All contain the neurotoxin glycoside aesculin, which is destructive to red blood cells. Although ruminants can feed on very young shoots without harm, and squirrels are able to tolerate the nuts, this toxin protects the buckeye from damage or death by grazing animals. As Ridgeway points out, “the sweetly fragrant flowers of this tree provide a rich pollen and nectar source for native bees, hummingbirds, and many species of butterflies” and are toxic only to non-native honey bees. Honey bees that do survive after ingesting buckeye toxins reproduce “buckeyed-bees” that hatch with deformed, crippled wings or malformed legs and bodies. Surviving Drought and Fire: Buckeyes employ two of the most successful adaptations to Mediterranean climates: drought avoidance and a long taproot. These trees begin their annual growth cycle in the late winter and early spring rainy season, and enter dormancy in summer. By shedding their leaves early, they avoid loss of water from transpiration through the leaves. This adaptation to our long, hot, dry summers gives the plant a nice long rest period before the rains begin. A deep taproot allows the buckeye to find water in even the driest of years. 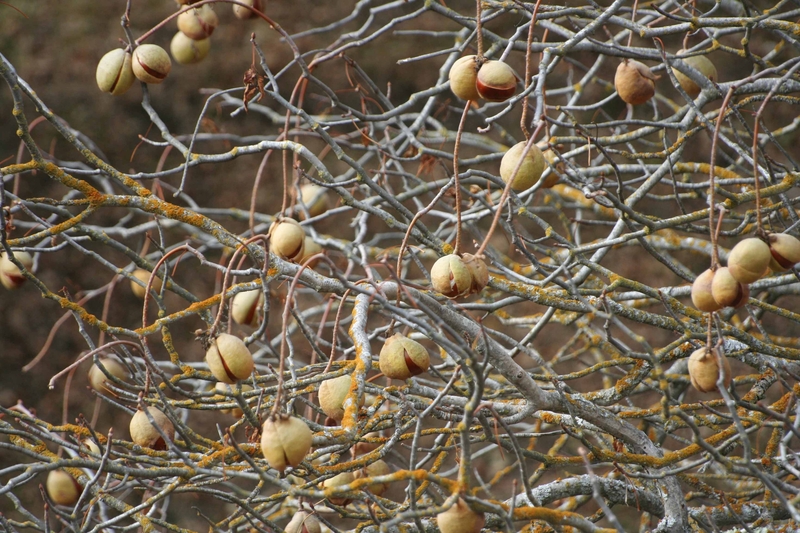 A fully developed root system also helps mature California buckeyes to survive drought by enabling the plant to both save and draw on food and water reserves. According to USDA research, California buckeyes recover rapidly following a fire, sending out new shoots during the first growing season, and growing rapidly in following seasons. Some buckeyes can exceed their pre-fire biomass within a few years. They can sprout from their root crown after top-kill by fire within a few weeks, even in the summer months. The USDA also notes that buckeye seeds will probably not survive fire because they are highly susceptible to desiccation by heat. Native American Uses: Native groups did find the buckeye nut to be of some use as a food supply despite its toxicity, primarily when acorn harvests were sparse. They rendered the buckeye seed palatable by boiling and leaching the toxin out of the nut meats for several days, after which the nuts could be ground into meal similar to that made from acorns. The same toxin that limited the buckeye seed to a food source only in times of hunger was used to snare a more delicious high protein food source. Native California tribes, including the Pomo, Yokut, and Luiseño, cleverly used the ground-up powder of buckeye seeds to stupefy schools of fish in small streams, making them easier to catch. And the smooth, straight branches of the buckeye made it useful to native peoples as a bow drill and a fire drill. Our native buckeye is a California beauty and a hardy survivor in some of the least hospitable habitats. In the biological contest for survival, this tough, gorgeous plant holds a winning hand. 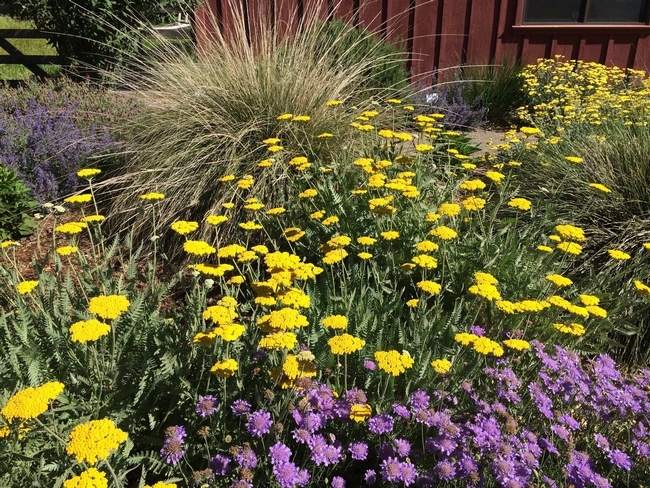 For more information on gardening in our area, visit the Butte County Master Gardener web page at: http://ucanr.edu/sites/bcmg/. If you have a gardening question or problem, call our Hotline at (530) 538-720l. What drives the evolutionary journey of the flora and fauna that populate our globe? Blue Oak. Photo by Yath at Wikipedia. Darwin, the product of a strictly codified class society beset by enormous economic inequalities, identified a major factor of evolution to be competition for finite resources. Those species that clambered to the top of the evolutionary heap benefitted from genetic mutations and / or adaptations that gave them a biological edge over their competitors. Some species cooperate by sharing resources. For example, in Tortuguero, a tiny strip of beach along the northeastern shoulder of Costa Rica, four separate species of sea turtle lay their eggs each year. They migrate to the beach at different times, ranging from early March to October, and feed on different resources. Millions of turtles, and untold numbers of their babies, have shared the same tiny piece of real estate for eons. Here in our own backyard, there are species that have evolved to exploit ecological niches that very few others claim. These are the various oaks, conifers, and woody shrubs that populate the foothill woodland and chaparral zone of the Western Sierra Nevada and Coast Range mountains. A dominant species in this environmental nook is the blue oak (Quercus douglasii). According to Andrew Conlin, Soil Scientist with the Natural Resources Conservation Service (NRCS), “the presence of blue oak woodlands indicates really rough growing conditions: shallow, tough soils” as opposed to the rich loamy soils of the valley, which are preferred by valley oaks. Blue oaks are native to California's foothills, South Coast Range, North Coast Range and San Francisco Bay Area, forming a botanical loop around the Central Valley. Depending on the source consulted, these trees average between 30 and 80 feet tall. But all sources agree that the blue oak is the most drought tolerant of all the deciduous oaks in the state. Adaptations to survive the long, hot, dry summers and sparse winter rains of our Mediterranean climate include thick leaves with a bluish-green color. According to the US Department of Agriculture (USDA), blue-gray-green leaf color reduces heat absorption. During severely hot and dry years, blue oaks will sometimes shed their leaves and go dormant to conserve energy, allowing these tough little oaks to survive temperatures above 100° F for several weeks at a time. Like many plants growing in marginal soils, blue oaks are slow growers, usually increasing only a few inches each year. Blue Oak leaves and acorn shells. Photo by Eugene Zelenko at Wikipedia. A further strategy to survive drought and fire conditions is the blue oak's extensive root system, which allows it to grow through cracks in rocks to depths of 80 feet in order to reach ground water, helping it to survive in fire-prone and arid regions (Blue Planet Biomes). 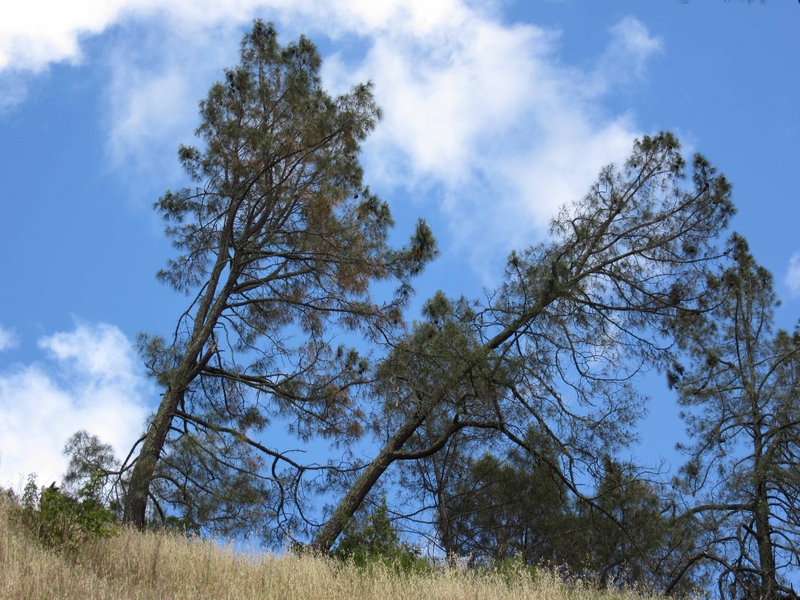 Although blue oaks can tolerate fast-burning grass fires, they have less success in surviving hotter brush fires, according to University of California Department of Agriculture and Natural Resources (UCANR). If a tree does survive a fire event, it can reproduce both through seeds and by sprouting from burnt stumps. 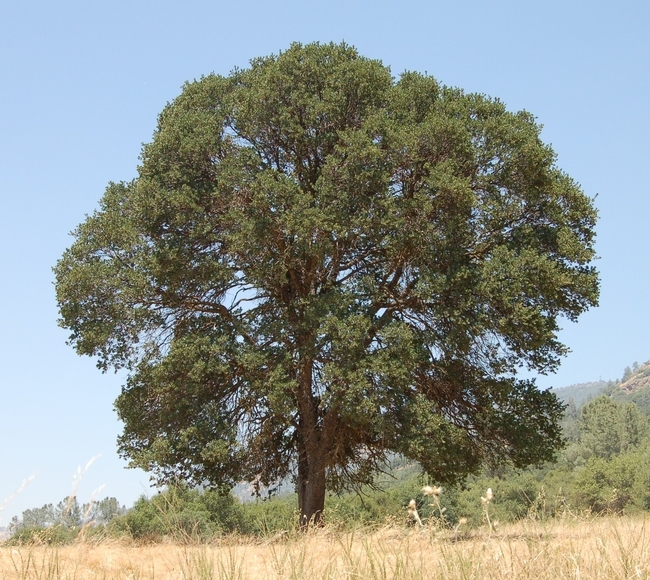 Blue oaks can produce sprouts after a low- to moderate-severity surface fire, and younger trees have the edge on older trees for fire survival odds. On younger trees, the light-colored bark (hence “white oak”) is thick and helps reduce fire damage, the USDA notes, whereas the bark of mature blue oaks is thin and will flake off as the trees age, making older blue oaks less insulated against fire. 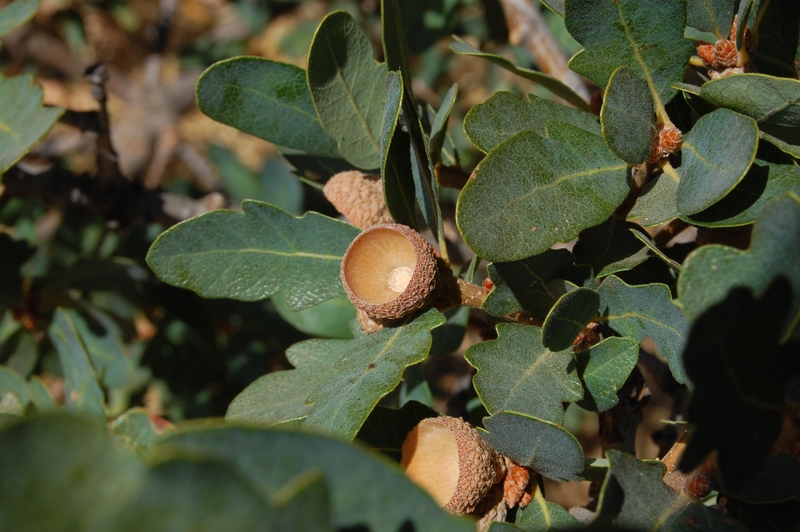 After a fire, blue oaks can also re-establish from acorns that have dropped from surviving parent trees and/or been dispersed by animals, among other possibilities. USDA research also reveals that the blue oak's post-fire recovery is likely aided by the fact that it withstands extreme drought by dropping leaves under water stress and producing a flush of new leaves when wet weather returns. In fact, in wet years, crown-scorched blue oaks may produce a flush of new leaves soon after fire. All parts of the blue oak were woven deeply into the culture and survival of California's native peoples. It was one of more than a dozen oak species whose acorns contributed a major source of dietary nutrients and calories. Because of their superior flavor, blue oak acorns were among the most commonly gathered. A Plant Guide published by the Natural Resources Conservation Service (NRCS) provides an exhaustive list of the ways California Native Americans used blue oak wood, bark, and acorns, including as “medicine, dyes, utensils, games, toys, and construction materials.” Locally, the Maidu used oak shoots to frame cradleboards and oak posts to construct shelter, and the Yana used an oak paddle in cooking. Traps for birds were baited with acorns, and split acorns became dice for gambling. Besides providing physical sustenance to native peoples, I imagine that the peaceful beauty of blue oak woodlands fed their souls. Twisted, dwarfed blue oak silhouettes are a classic component of the California landscape. These trees are prime examples of successful adaptation to truly demanding habitat and climate conditions. NRCS:BLUE OAK: Quercus douglasii Hook. & Arn.